Portsmouth subcontractor DKW Engineering prides itself on an ability to value-engineer complex components and invest in new equipment to fulfil production economically. A good example is the re-engineering of a family of 316 stainless steel parts that go into flow meters used in the medical industry. It resulted in DKW winning a prestigious, long-running contract to produce an increasing variety of the components and entailed the installation of a German-built Index C200 turn-milling centre from UK agent, Kingsbury. The business came from an existing DKW customer that was putting the work out to a different subcontractor, which was machining the parts from stainless steel castings. The components then had to be sent out for expensive polishing, which often revealed porosity on the surface, making those parts unusable. Initially, at the end of 2014, DKW followed suit by machining similar castings, but it quickly became clear to managing director Nick Iacobucci that the designs could be changed to allow machining from round stainless steel bar instead. He also saw that it would be possible to omit insertion of a pin into the component, doing away with an assembly operation. As an added bonus, the higher surface finish achievable would eliminate the need for polishing. Mr Iacobucci approached three potential suppliers of turning centres that would be capable of producing the family of components, which range up to 65 mm in diameter. 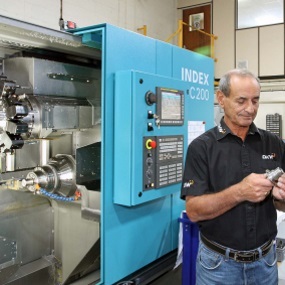 Gosport-based Kingsbury was the chosen supplier, as it demonstrated that an Index C200 turn-milling centre could produce the parts to the required dimensional tolerances down to ± 0.05 mm and achieve 0.8 Ra surface finish. Moreover, the new process route allows the components to be produced in one hit rather than the previous five operations, promoting accuracy and reducing work in progress. In conjunction with DKW, Kingsbury ran off 45 samples in its Gosport technical centre and they all passed every test. An Index C200 fed by an Iemca Master 80HF bar magazine was duly installed at DKW’s Portsmouth factory in October 2015, complete with a gripper arm for picking each finished part out of the counter spindle and placing it onto a conveyor. The bottom line is that manufacturing cost per part is only 8 per cent more expensive when using solid bar rather than castings, but the yield of good parts is more than double. Overall, cost and lead-time per part are reduced considerably across the range of nine different flow meter components currently being produced. As the value of each part is several hundred pounds, savings are substantial. Mr Iacobucci said, “Part of the reason we are able to machine the components so economically from bar is that we are using a triple-turret, twin-spindle lathe. “Two turrets can operate at either spindle and three tools are in cut simultaneously during large sections of the cycles, which include a lot of balanced turning and milling. He went on to describe Kingsbury’s applications engineering as superb. For instance, the supplier recommended the use of trochoidal milling to produce a slot in the component. The process involves running a Delcam Vortex milling cycle in the machine’s Fanuc series 31i-model B control. An Iscar solid carbide, 6.5 mm diameter side-and-face milling cutter produces the feature, its width being machined to a tolerance of ± 0.1 mm. If a cutter were to mill the full width of the slot in a linear pass, vibration would compromise accuracy and shorten tool life dramatically. Mr Iacobucci confirmed, “Kingsbury met all expectations during delivery and commissioning of the Index C200 and has been prompt in sorting out any small problems that have arisen. “We have also been impressed with the provision of their three training modules covering programming, machine operation and maintenance. “A feature that sets the Index lathe apart from others on the market is the kinematic actuation of the three turrets, rather than via standard compound slides. There are dozens more flow meter components in the family that will need to be produced in the coming months and years. Production staff at DKW are keen to put other complex parts onto the machine as well to evaluate further savings that can undoubtedly be made. Stainless steel accounts for around 60 per cent of throughput at the Portsmouth factory, with titanium and nickel alloys also frequently machined. The robustness of the Index C200 makes it ideally suited to processing these difficult materials. There is considerable potential work for the machine in the oil and gas, petrochemical, nuclear and aerospace industries. Around one-fifth of the ISO 9001:2008-approved subcontractor’s turnover is already derived indirectly from the aerospace sector. The company is now actively pursuing the AS9100 quality management standard relevant to that industry to elevate it to tier 1 supplier status. Main picture: A view from the other end of the Index C200, showing the Iemca Master 80HF feeding the turn-milling centre. In text above: Nick Iacobucci with one of the machined stainless steel medical parts, which are produced from 55 mm and 65 mm diameter bar.